Strawbridge Lake is just one of the many natural landscapes that highlight Moorestown’s beauty. However, over the years, an accumulation of spatterdock has led Moorestown Township Council to consider ways to remove the plant from the 32.9-acre lake. 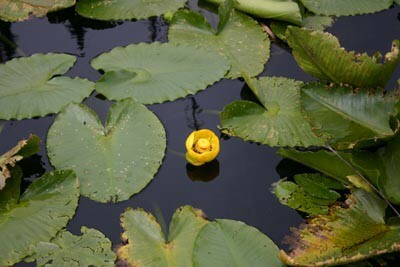 A rooted, floating-leaved plant popular in the northeastern U.S., spatterdock appears in early spring but remains below the lake’s surface and resembles lettuce. Yet, by late spring, the dark green, heart-shaped leaves make their way to the surface and can even stand above the water. Although there are no apparent health concerns for people, animals or to the lake itself related to spatterdock, the plant is invasive, difficult to control and maintain and takes away from the appearance of Strawbridge Lake. As a result, a bid was opened on July 22 that suggested ways for the township to successfully remove the plant. “It’s invasive and inhabits a lot of lakes in Burlington County and New Jersey overall, totally covering the tops of the lakes and shading the bottom so that nothing else can grow. It also clogs up a lot of waterways,” Chet Dawson, chair of the Environmental Advisory Committee, said. In 2015, council authorized $80,000 from the Moorestown Open Space Recreation, Farmland and Historic Preservation Trust Fund to be used for environmental improvements at Strawbridge Lake. However, these improvements were only made to a small portion of the lake. For the necessary funds to be allocated to the project, council would have to pass a resolution to again utilize the town’s Open Space Trust Fund. Although all councilmembers agreed the removal of spatterdock would be beneficial, Deputy Mayor Victoria Napolitano questioned the use of the open space trust fund. She said she did not want this fund to become the “cookie jar” the township digs into each time it needs project funding. Despite the time needed for council to determine whether it can justly use of these funds, removing the plant is a time-sensitive issue. Once the temperature drops for the year, it will become increasingly difficult to see and therefore remove. Dawson believes it will take six to eight weeks for the process to be completed, providing further reason for council to either push the bid forward or put it off another year. Even with immediate attention, the township will be forced to work around the schedules of the companies that provide this service, as there are few. Additionally, this project will remain ongoing, as a maintenance program would need to be established, and there is a small chance 100 percent of the spatterdock will ever be removed.